and Jean Valek, 16, building snowman along Angeles Crest Highway. 3-4: Scene of Angeles Crest Highway near Red Box. 7: Scene at Red Box. 8: Mrs. Connie Marcos showing her daughter, Susan, 5, scene at Red Box. 9-10, l to r: John Patrick Meehan III, 7, and brother, Paul Meehan, 5, walk down path off Angeles Crest Highway. 11-12: Bob Reese, 20, dropping big hunk of snow on his galfriend, Carol Littleton -- along angeles Crest Highway. 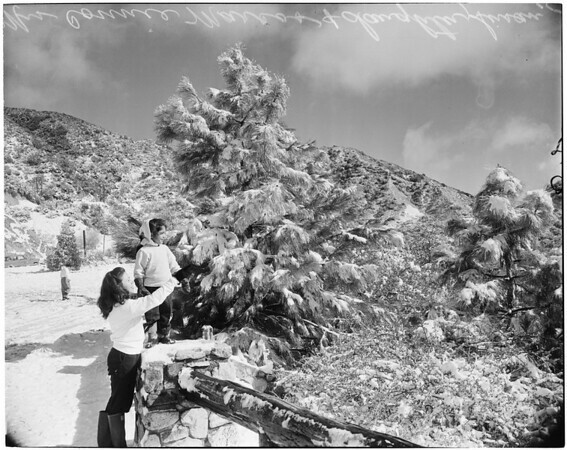 13-14: Tony Benedict and his wife, Mrs. Joan Benedict, engaging in snowball fight along Angeles Crest Highway near Red Box. 15: Snow-topped San Gabriel Mountain can be seen from Glendale."